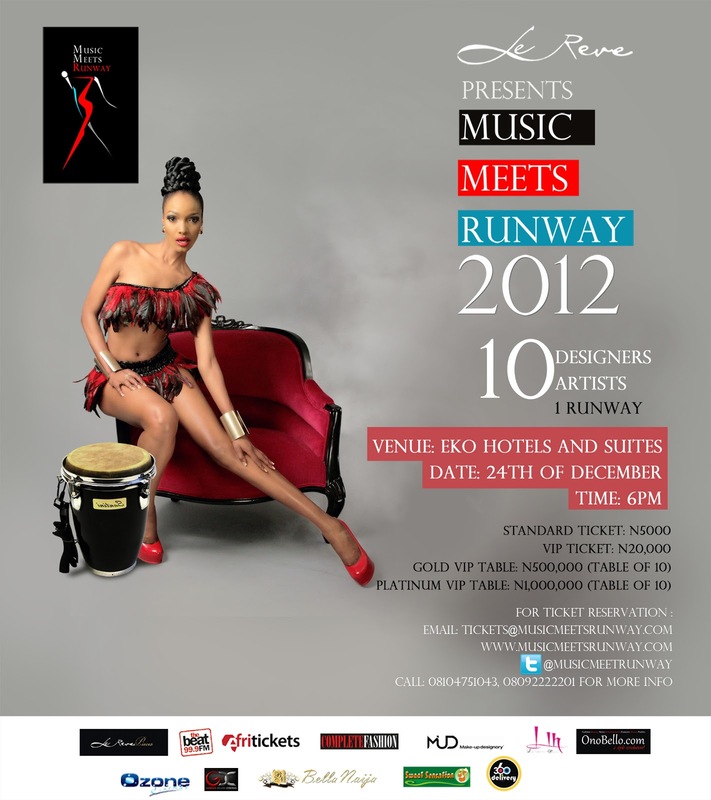 In case you did not know, MUSIC MEETS RUNWAY is back. I did not get to attend the first edition that held last year but now I get to have a press pass to attend this year's edition. If like me you are obsessed with home delivery, you should call 360 Delivery on: 08105004000 to deliver your tickets to your door step. Tickets are also available at: Eko Hotel & Suites, Genesis Deluxe Cinema, Ozone Cinema, Get Arena, Le Reve Pieces (Lekki Phase 1), L’Espace&Selected Sweet Sensation outlets. MMR 2012 is supported by: Le Reve Pieces, Ciroc, Complete Fashion, MUD, OnoBello.com, L’Espace, Ozone Cinema, Sweet Sensation, 360 Delivery, 360 Nobs, Afritickets, The BeatFm 99.9, Genesis Deluxe Cinemas, Lo'Lavita Hair and Bella Naija.